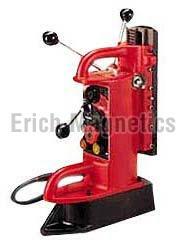 We have established ourselves as prominent Manufacturers, Exporters and Suppliers of the Electromagnetic Drill Stand. We deal in tested, certified, precisely designed and developed Electromagnetic Drill Stand. The offered Electromagnetic Drill Stand is manufactured using sophisticated machines and latest technology. Before final dispatch, our dexterous team members test and examine the Electromagnetic Drill Stand on quality parameters such as durability, performance and design. Two models : M 220 R: 1/2" and M-380 R 11/2"